Submitted by Jeff Buster on Wed, 02/27/2008 - 18:42. The Cleveland City Council Chamber is a grand room, with wood paneling, curved seating and a colorful mural above President Sweeney’s high backed seat. Steam from Cleveland Thermal heats the chamber – and there was plenty of steam Monday night. There was so much heat that some in the room appeared a bit drowsy. Before the meeting was called to order, there was the usual milling around and friendly colloquy between various members of the public and various council persons. This was the chance to put in a few sentences about something on your mind. There were about 10 members of the public, like me, who had 50 years of AMP coal on their minds. I told Mr. Kelley that his understanding was very different from my understanding. I indicated that the City of Cleveland, not merely CPP, had passed an ordinance which constituted a contract with AMP, and that the full faith and full resources of the city of Cleveland taxpayers – for the next 50 years – was committed to AMP. Mr. Kelley indicated he was not concerned. Joe Cimperman came up and I went through my points again. 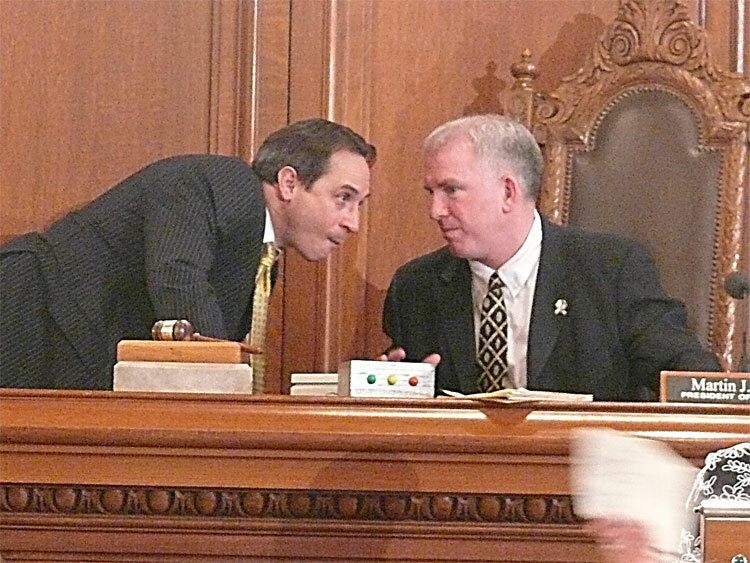 “Joe, the basis of my primary concern about this AMP contract isn’t global warming, my main concern it that the contract is a economic trap for Cleveland. Mr. Cimperman commented that he appreciated my concern and moved off to speak with someone else. I could tell Mr. Cimperman was not seeing it my way but was just being polite. I wanted to be sarcastic and say: “If 50 years is good because of price stability – wouldn’t 100 or 200 years be even more stable?” I didn’t. As we waited a bit more for the Council meeting to begin, Herb Crowther and I spoke with Mr. Santiago. During the day on Monday Mr. Crowther and I had made an effort to find out what the language was regarding the AMP contract (withdrawal) that we assumed was listed on the Council’s agenda for Monday night. I called the Council clerk on Monday morning and was transferred to “legislative” where I left a voice mail (I never received a return call). Seeking the same agenda information, Mr. Crowther had contacted Mr. Santiago. Mr. Santiago had told Herb earlier in the day in a telephone conversation that the Public Utilities Commission was going to meet Tuesday morning to determine whether to recommend to the full Council either to continue with the AMP contract, or withdraw from the AMP contract. Mr. Santiago is one of the council members on the Public Utilities commission. Mr. Santiago didn’t attend PU meeting on Friday. I suggested to Mr. Santiago that a 50 year long contract with open ended costs was not in the interest of the City. Mr. Santiago replied that he was not familiar with the contract language and didn’t know the term of the contract. Frankly, from what I read on Mr. Santiago’s face I don’t think he knew the AMP-Cleveland contract had a 50 year term. I felt as if speaking further with Mr. Santiago was not an effective use of time in the Council chamber. Then Mr. Sweeny climbed up onto the dais and gaveled the meeting to order at 7:15. Next was a prayer, then the pledge of allegiance. Some of the council persons present (19) took their seats behind their desk-top name plate, while other members continued to move about the room and chit chat. The new clerk (Ms. Lipovan’s replacement) first asked if there were condolence resolutions for people who had passed. A few Councilors asked for them. Then the clerk asked for congratulatory resolutions and a few of those were announced. Then the clerk began to read the business agenda – her verbal pace was similar to that of a professional auctioneer. Lots of numbers (the number of the ordinance being read into the record, and a one sentence description like “shut the public way between west so and so” Batches of these ordinances were read off and then Mr. Sweeney would ask for a suspension of the rules and then the council would vote on the entire batch which the clerk had read. Each vote was unanimous and the councilors’ names were all read rapid-fire into the record by the clerk. This was repeated a few times over about a 30 minute period. Mr. Zone climbed up on the dais and said something to President Sweeney (photo above). I’ll bet Mr. Zone was queuing up the AMP dunk. Soothed by the heat and the flow of the clerks voice I was moving around the back of the public seating gallery taking photos when Matt Zone came up to me with a few documents in his hand . He told me that he had read what I had written on Realneo and he appreciated the…and he couldn’t find the word he wanted…so I said “fairness”…and he said yes. Looking down at the documents in his hand he went on to say that he felt the 80 megawatts of AMP coal would be ok as “base load” for CPP and that he was just about to submit two resolutions to Council. The first resolution was to acknowledge that council desired to go ahead with the Ordinance contract with AMP for 50 years - which was passed last fall by Council - and the other resolution was for CPP to conduct and IRP (integrated resources plan). The clerk’s voice continued to drone on with numbers and details in the background. Mr. Zone looked over his shoulder and said he had to get the resolutions passed out to the council persons. He stopped first and gave copies to a citizen group including Peter Griesinger. Soon the clerk reached a pause and Mr. Sweeny called on Mr. Zone who was standing at his seat. Mr. Zone told the chamber that he wanted to have the chamber show appreciation for the hard work which had been done by Peter Griesinger, and 3 or four persons from the Sierra Club. Mr. Zone told the chamber that the effort these people had made before the Public Utilities Committee over the last 6 months had really helped the Committee understand the complexities of the AMP contract. Mr. Zone asked the group of citizen volunteers to stand for applause from the chamber - the entire chamber applauded. When Mr. Zone had asked the citizen volunteers to stand for a round of applause I felt uncomfortable for them. It seemed a bit cruel for Mr. Zone to publicly compliment those citizen volunteers who were against the AMP contract while concurrently Mr. Zone was supporting the AMP Contract. Something seemed amiss – and I was glad I wasn’t right then sitting with the citizen group. If I had been in the group I would have had to genuflect - or look pretty impolite in front of many of the public who weren’t familiar with all the behind the scenes issues with AMP. Fortunately, I happened to be over in a front corner of the chamber working on a photo angle of Mr. Zone. It was as if Mr. Zone was calling for the crowd to salute the loser – not merely show appreciation for citizen volunteers. I had one of those back of the neck-tingle sensations - I felt that if I had been in the group that standing up for a round of applause (applause offered through Mr. Zone - the councilor who was not voting against AMP) was a bit perverted. The clerk, Patricia Britt, continued to call out legislation with numbers and brief descriptions. Another suspension of the Rules. After this vote Mr. Polensek rose and was recognized. He recited a number and said he voted against that particular item. The clerk began to read the next item of business. Mr. Cummins then pulled up his telescoping desk microphone, stood, and asked to return to the previous item that Mr. Polensek had voted against. Mr. Cummins said that he too wanted his vote to be recorded as against that item. Mr. Cummins said the he would have risen sooner but that he had just received the document from Mr. Zone and hadn’t had time to focus on it. Mr. Sweeney announced that the final vote for that item was 17 for, 2 against. I had been paying attention too, but at this point I really had no idea what it was that Mr. Polensek and Mr Cummins had voted against. I assumed it had something to do with AMP. The Clerk wrapped up business and the meeting was adjourned at 7:55. All the Council business had transpired in about 40 minutes. Everyone began to leave the Chamber. Mr. Crowther came over to me and said he had heard the clerk say the word “AMP”. I said I hadn’t heard the word AMP. Then it began to dawn on Herb and me what had happened. There was nothing about AMP on the Council Agenda! There didn’t need to be anything on the agenda about AMP! AMP was already in the bag from last October! Back in October 2007 the City Council had passed Ordinance 16-5307 approving the AMP coal contract for 50 years. Since there was no legislation on the Monday night agenda on which council could vote to rescind the AMP coal Ordinance – and since March 1st was the deadline to opt out of AMP, there was really nothing about AMP which the council could even vote on Monday night. The resolutions which Mr. Zone introduced Monday night meant nothing. The language of the resolution merely said that the City Council still affirmed that the council supported the October Ordinance. In other words, while CPP, AMP, ION, the Public Utilities Committee, and members of the public spent 9 hours on Friday at the PU committee meeting – there was nothing on the council agenda which could have been acted on Monday to rescind the AMP contract - so the Friday meeting was mere diversion. My understanding of the Ohio Open Meeting Laws is that by the time of the Friday PU committee meeting it was too late to add anything to the City Council agenda for the Monday meeting. That means that everyone who took the day Friday to attend the PU committee ION hearing was wasting their time in a futile dog and pony show supervised by PU Committee chair Matt Zone. I don’t like being patronized and I don’t like someone taking advantage of me and my time. Matt Zone did both, with a smile which lasted all day Friday. Maybe Mr. Zone was smiling because he knew everyone in the audience were dopes – because the AMP deal was done, completely done. The entire operation on Friday was only to delude the public, and to help whitewash the decision to which Mr. Zone had already completely and irreversibly committed. It would not have mattered what ION had reported, because it was too late to put any Ordinance rescission on the agenda for the City Council meeting on Monday. Mr. Zone’s fraudulent and phony performance – acting as if he were earnestly listening to the public and then asking AMP and CPP to respond to the public comments, is particularly egregious because he was abusing the public’s trust in what at the time seemed like Mr. Zones’ earnestness and fairness, while in fact Mr. Zone knew that the audience had already been sold down the river. Mr. Zone perpetrated a mean abuse of the public’s trust – knowingly giving the audience the false hope that they could make a difference, when Mr. Zone knew the deal was done. Not surprisingly, I won’t trust Mr. Zone with anything in the future. You can read the “news” about that resolution here on the Council web site. The resolution is a distortion of the ION report I heard. The resolution attempts to excuse the AMP deal as one that was reasonably considered by the Council and one that is supported by the ION report. This is false. One reason it is false is because the ION report was only presented to the 4 or 5 PU committee members who where in attendance at the Friday hearing. That leaves 15 members of the Council who know nothing of the ION presentation. I’ll even bet the Zone AMP "approval" resolution was written prior to the Friday PU Committee meeting – in preparation for the Monday evening Council meeting. Why didn't these (non volunteer, ie salaried) “green preaching” people speak out during the AMP 50-years-more coal discussion? The following names are hyperlinked to their organization. Perhaps countervailing financial/political influences had them all gagged? I didn’t hear from one of them at the several hearings I attended. If I am wrong, please let me know. Submitted by Susan Miller on Thu, 02/28/2008 - 10:00. Looks like some of the aforementioned characters were preparing for the pull, while AMP had already achieved the push. Oh, if we could only zoom out far enough to see the whole picture. While we whine and wail about utility rates no one seems to be speaking that word, "externality". The first day of hearings on the House Republican leadership's green energy bill was more of a love-in than a critical examination of the bill's effect on electric rates. A bevy of green advocates and industry representatives appeared before the Public Utilities Committee to predict the bill would lead to $18 billion in investments in Ohio and create up to 1 million jobs but have little or minimal impact on consumer electric rates. The bill, created by Columbus suburban Republican Rep. Jim McGregor and Speaker Jon Husted, a Republican from Kettering, had input from some of the promoters as long ago as December. Husted and McGregor, flanked by many of the same advocates, unveiled it last week as a supplement to Gov. Ted Strickland's comprehensive energy bill. His bill contained many of the same goals -- to require utilities to generate a significant percentage of power with renewable technologies by 2025 -- but lacked strong enforcement provisions or a strict timetable. "I'm a consumer advocate. I would not be standing here if I thought renewable energy would increase rates," said William Spratley, who was Ohio consumers' counsel for 16 years and is now an advocate of wind and solar energy as executive director of Green Energy Ohio. Spratley provided the lawmakers with copies of an economic study the American Solar Energy Society commissioned on the effect of renewable energy and energy efficiency programs. That study, released preliminarily last summer in Cleveland at the society's solar convention, concluded that by 2030, a focused renewable energy program could produce 175,000 new, well-paying jobs in Ohio -- and that energy efficiency mandates could lead to 2 million new jobs. Hans Detweiler of the American Wind Energy Association said the wind industry took $10 billion in new orders last year. But none in Ohio. Requiring 12.5 percent of the power sold by Ohio utilities to come from renewable technologies by 2025 and setting the timetable to begin next year would open the state to a flood of projects. Construction jobs would last 17 years -- that is, through 2025 -- because the proposed law requires a larger percentage of renewable energy production every year. A $200 million wind farm in a rural county would create an enormous new tax base. Such farms often become the largest taxpayer in the county. "It's all related to whether or not Ohio creates a market," he told them. "It's very straight forward." And there is not much of a risk in price spikes, he said. He said that requiring benchmarks to be met in the early years of the mandate (as the bill does) is critical. Norm Johnston, CEO of Solar Fields, a startup solar company near Toledo that has partnered with Germany's largest solar company, told the committee that the cost of solar power produced by an array his company built is about 8 cents per kilowatt-hour -- about 3.5 cents cheaper than FirstEnergy's delivered price. Johnston pointed out that solar has no fuel costs, only construction costs, and that solar technology is becoming less costly. Johnston debated with some members about the efficiency of solar in Ohio, arguing that Ohio has more solar potential than Germany, which is the world's leader in solar installation. He said Ohio has 89 percent of the sunlight of the American Southwest. Richard Stuebi of the Cleveland Foundation urged the committee to add language creating a special "carve out" requiring wind turbines in Lake Erie. He also warned that they should be vigilant in getting the bill through the Senate. The Senate version of the bill is much weaker. Stuebi agreed under questioning that he has said he would support putting all of the extra cost of renewable technology on residential rate payers -- if that was the only way it could be done -- because he thinks the extra cost would be minimal. Only a few committee members had critical questions about the bill's language, including whether Ohio really needed to spend the money creating a new bureaucracy, the Renewable Energy Authority, and whether its members should have stronger credentials than the bill called for. They also noted that McGregor's bill seemed to allow any nuclear power plant to qualify as advanced energy. Strickland's bill called for "advanced" nuclear. McGregor said that was likely an oversight. Committee Chairman John Hagan, an Alliance Republican, seemed open to the questions, asking criticizing members to put their recommendations in writing. The hearings continue today. Hagan has said he wants to get the bill to the House floor in March. Is it too difficult to wrap your head around the possibility that renewable energy could be beneficial, Mr. Funk? Is your characterization that this meeting was a "love-in" meant to be cynical and demeaning to the good efforts to turn around Ohio's environmental and economic health and wellbeing? In an email from a friend in NYC yesterday on the issue of finding a developer for the Ameritrust Complex, he stated that the developers he had spoken with regarding development of the site saw it (and Ohio) as a "tar pit". Yes, I thought, this state is a tar pit and we’d better get busy changing that impression. While neighboring states adopt renewable portfolio standards and erect turbines and solar installations, Ohio falls farther and farther behind the curve of today's understanding of the big costs coming down the pike - the costs of the externalities of this wasteful way of life. Let's elect some bright young minds to office and "pull" Ohio into the 21st century. Submitted by lmcshane on Sat, 03/01/2008 - 10:19. What's new? Thanks Jeff for being the only REAL reporter out there. And thank you to Councilmen Brian Cummins and Mike Polensek for voting with their conscience.